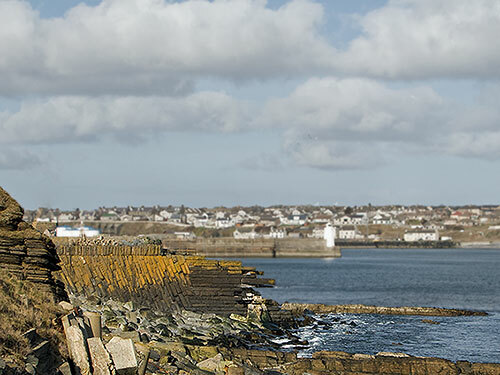 Some five miles south of Wick lies Sarclet Haven, another of Caithness’s deserted, haunted harbours—once a scene of thriving industry, now just a few ruined buildings, the tussocky grass littered with ankle-turning lumps of stone and rusty bits of cable. The whole coast has numerous inlets like this, as though the shoreline of the east Highlands was an unfinished jigsaw that God left lying around while he went to answer the door, and never returned to—or maybe the box was missing a few pieces, I don’t know. A hundred and fifty years ago the harbour would have been packed with boats in the summer months for the herring fishing. But it was pretty much wrecked by the same terrible storms that finally demolished the Wick breakwater in 1872, and the fishcurers packed up and moved their business the few miles north to town. On Sunday we parked the car at the top of the cliffs and followed the path, a gentle ramp really, down to the cove. 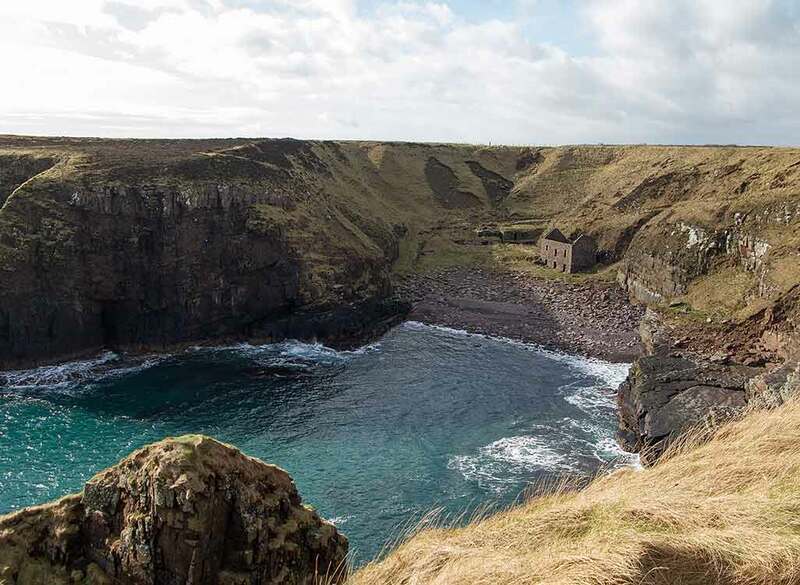 We had it all to ourselves, except for the disapproving Calvinist seabirds, who seemed quite indignant that we were there to disturb them and not in church; and we could hear larks and curlews fooling about in the fields somewhere above the cliffs. The haven is filled with ghosts. 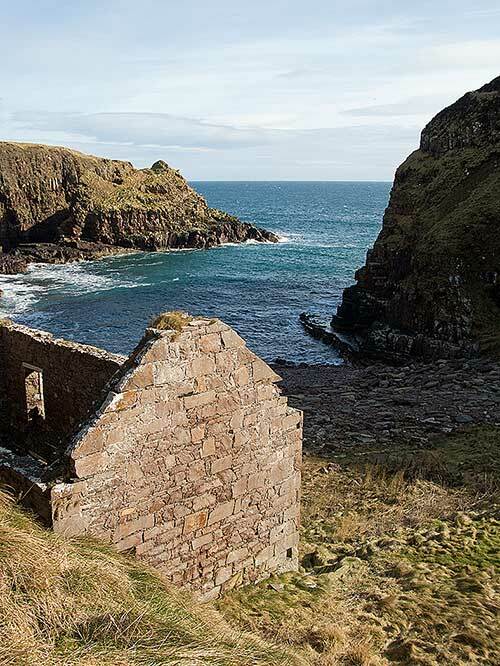 There’s a roofless stone building for storing salt and barrels, and a great rusting windlass which was used to winch the boats up onto the shingle, and other human remains. It’s very beautiful, and lonely, and sad. Sometimes I think if I win the lottery I shall hire a bunch of actors to recreate the fishing boom each summer for tourists in a place like Sarclet—a bit like Plimoth Plantation in Massachusetts but with added fish guts. Other times, I think I’ll just move somewhere warm, where the wind doesn’t strip trees like a nuclear blast and winter means maybe wearing long trousers, or any trousers come to that, and shall spend my days in a hammock on the beach sipping drinks I can’t pronounce and telling a spellbound audience tall tales about archives. I’ve finished the first sleeve of the gansey: one down, one to go. The sleeve is just under 18 inches long, and the cuff is three inches; and I decreased down from 117 stitches to 96 for the cuff. So, now all I have to do is knuckle down and knit the other sleeve, which is good for the soul and reminds us that we are not put here on Earth for pleasure alone. If I can apply myself I might finish it by the end of the month. It is a truly magical little cove at Sarclet. What a lovely spot in which to spend the afternoon! Thank you for fleshing it out with a bit of detail (I had been wondering about its story since Margaret put the photo up yesterday). The gansey is looking very handsome. 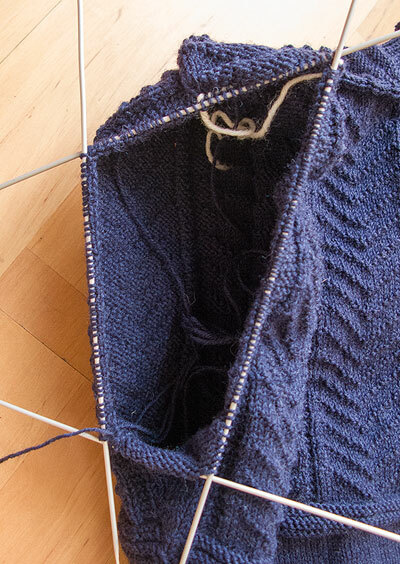 Not that my thoughts turn much to knitting these days; which is something you will discover for yourself if you opt for the hammock in a sunny clime. Average daytime highs in the range of 70 – 80 degrees make the very thought of wool exotic, foreign, and simply not possible. Perhaps you will weave hats out of pandanus leaves instead (they have more panache, and offer better protection, than a ball cap)…and imagine that you are one of the Bounty descendants on Pitcairn. There are an amazing number of these marvellous coves dotted along the coast within 20-30 miles of here—Lybster, Sarclet, Clyth, Latheronwheel, as well as the likes of Dunbeath and Helmsdale. Why it’s not better known astonishes me—everyone should come and see them, not just zonk past them on the way to John O’Groats. To be honest, I think I could live without jumpers if the price involved hammocks, shorts, and the chance to drink exciting drinks from hollowed-out coconut shells with a straw. I could even lean to speak the sub-Dickensian patois of the Pitcairn islanders, in a hello-me-covey-where’s-the-row kind way! (Or words to that effect…) Where do I sign up? Thanks for sharing the wonderful photos of the deserted harbor, and also last week’s links to the aurora, some spectacular color there. We had a nice promise of spring yesterday with 17C, and, in the Pacific Northwest, we are definitely ready for a change of season. 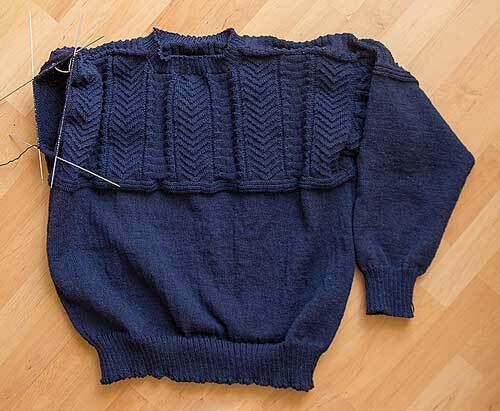 The cuff on your gansey is considerably shorter than you usually knit, was this a special request? Sleeve #2 well started already? You’re practically home free.